YMC student series violins are designed to produce remarkable sound, visual beauty, sturdiness, playability, and affordability to ensure that players will get the right start. Violin Case: Shaped foam carrying case with a luggage-grade nylon exterior and padded plush interior, light and durable. Bow: Ebony frog Brazil wood stick violin bows bow, with unbleached white Mongolian horse hair. Bow Collimator: Correct your bow pose, like a silent teacher remind. This product is specially tailored for beginners, become more and more children learn violin indispensable equipment. Shoulder Rest: Adjustable length and height, made of a strong high grade ABS material. Electronic Tuner: Chromatic, Guitar, Bass, Violin, Ukulele the color change to Green when in tuning. Tuning range: A0 (27.50 Hz) - C8 (4186 Hz). Including 3V CR2032 lithium battery. 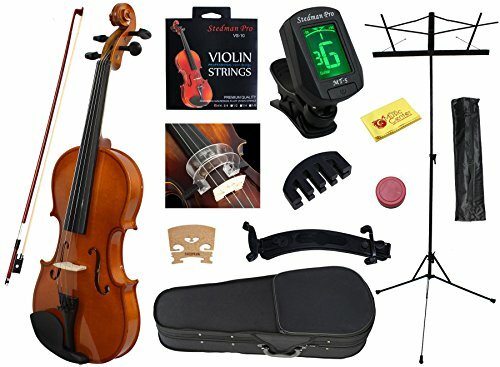 -Accessories Includes: polyfoam carrying case, shoulder rest, music sheet stand, electronic tuner, brazil wood stick violin bow, rosin, an extra set of strings, polishing cloth, mute, violin bow collimator. If you have any questions about this product by YMC, contact us by completing and submitting the form below. If you are looking for a specif part number, please include it with your message.